Wireless system with dual cavalier mic and transmitters. The Nady DW-22 Digital Wireless Microphone System brings you the superior sound quality of digital audio technology in a simple, easy-to-use and reliable package. 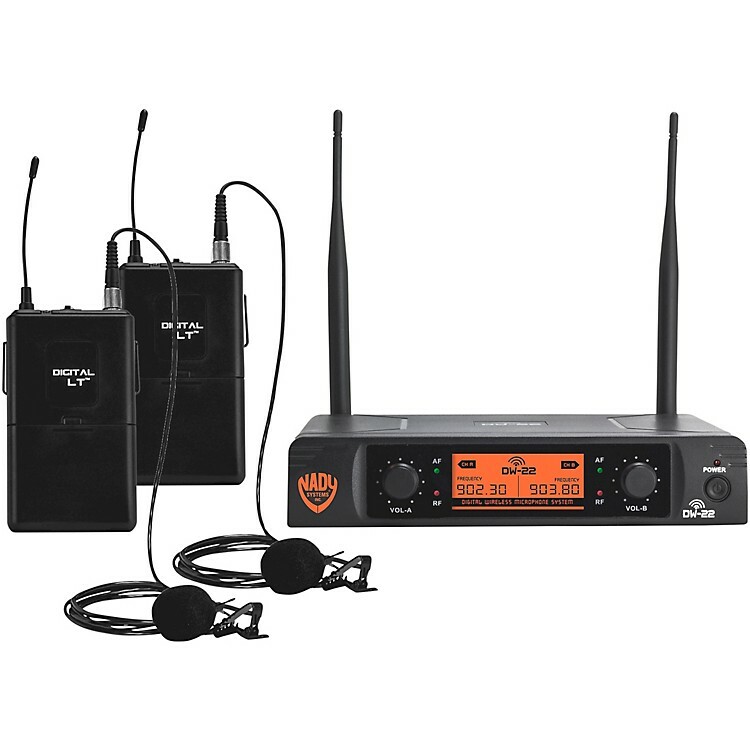 Available in a variety of combinations (with 3 types of transmitters to choose from: Digital HT™ handheld microphone, Digital LT™ LM-14/O lapel microphone or Digital LT™ HM-3 headset), this system couldn’t be easier to set up and operate. After inserting new AA batteries in the transmitters, just connect the AC adapter as well as the audio output(s) most suited to your set up (either microphone or line level) to the receiver and turn them both on. The system is now ready to go! This system is loaded with top professional operating features and offers the best performance and price value available in digital wireless. With 48 kHz / 24-bit digital audio conversion, low latency and clear channel operation in the UHF 900MHz band, the Nady DW-22 Digital Wireless Microphone System provides interference-free performance for any application. Perfect for presentations with two speakers.